There's something special about an album that takes a listener on a journey to a place they've never been before. Every album can be a journey if the listener is open to it, but not every album really takes us somewhere. There's something special about going along for the ride when we realize the music is going to carry us to a place we've never been. Pop music can be great and there's a place for it, but it just can't compare to the lifting that comes from feeling your mind transported by the music. Tuatara's music not only transports listeners and carries them on a journey, it takes them to exotic and mythical places. On the early, instrumental records it was up to the listener to tell the story of that journey. 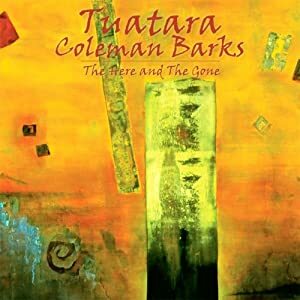 For The Here & The Gone, Tuatara has enlisted poet Coleman Barks to give voice and word to those explorations. Who is Coleman Barks and what is he doing fronting a band that features members of two of rock's enduring bands? Athens, Georgia is famous for two things: the University of Georgia and R.E.M. Barks was a professor at the former, Tuatara member Peter Buck is, of course, a member of the latter. One night in Athens in 1997, Tuatara was joined onstage by Barks. He began performing a reading of his poetry and the band composed a soundtrack to it spontaneously, on the spot. Ten years later, Barks made guest appearances on Tuatara's twin releases East of the Sun and West of the Moon. Now those collaborations have taken another step in their journey, recording an entire album of music and poetry. More than 25 compositions were recorded, 16 of them presented on The Here & The Gone. Even though I'd enjoyed the previous collaboration between them, I wasn't sure what to expect with THATG nor was I sure such a collaboration could sustain my interest over the course of the album. With that in the back of my mind I began listening and immediately felt the amazing lifting begin. The first lines of the first song, "A Grainy Taste," are an invitation and a travel itinerary. "A Grainy Taste," takes me to another place. I love this world — their world. Catch and release, falcons soaring through the air, wine so fresh and new it was never held in a clay jar, seeking God, hunting God. All that and we're only three lines into the record. Not a bad way to spend an hour. I haven't even mentioned the splendid way Rahim Al Haj's ancient oud and Luis Guerra's upright bass merge with Barrett Martin's vibes and Peter Buck's acoustic guitar. "Watertrance" is a funny, touching narrative of a father-son relationship. It may or may not be autobiographical, but it doesn't matter because the authenticity of the narrative comes from the wonderful weaving of local color and emotion. While "A Grainy Taste" is my favorite, I'd be hard pressed to find a better merging of music and words than "These Winter Skies." "An Invisible Bee" feels like a dramatic epic performed even at its relatively brief running time of four minutes. Peter Buck has never played anything blusier than the licks he contributes to "Good as Dead." Barks even provides some bluesy vocalizations before spinning the poem that provides the album its title. The wit and humor of "The Final Final" is accentuated by the knowing smile of the music, ending the journey on a beautiful high note. Track after track, Tuatara creates a tapestry and fills it with colors, shapes, and textures as Barks delivers his timeless poetry in his own inimitable fashion. Shotguns and the flames of Hell probably couldn't convince me to go to a poetry reading. A record of spoken poetry and music? Forget it! I would never choose that for myself and yet I haven't been able to stop listening to The Here & The Gone. After giving this all a lot of thought, I think I know why. George Harrison sang, "If you don't know where you're going, any road will take you there." It's the joy of discovery. It's the delight of knowing there are still more hills to climb. It's the pleasure of taking a trip but surrendering the navigation, giving yourself over to the music and letting it lead you rather than forcing it to exist in the confines of your usual preferences. It's the fun of being right about being wrong or being wrong about being right; it's the release of not caring about right or wrong. It's the journey and the destination.